A ToGuard dash cam monitors everything that occurs on a drive, providing evidence that can be used in a court of law or for insurance purposes. If you encounter an incident while driving, a ToGuard dash cam will have recorded the event in detail, as every model comes standard with loop recording. Having footage on your side can help you avoid spikes in insurance costs or additional speeding tickets. With a ToGuard dash cam mounted in your vehicle, you should feel confident as you take to the streets. Below we’ve compiled a list of our favorite dash cams. All offer drivers the kind of affordable coverage and protection they crave while out on the road. The ToGuard Stealth Recorder is a far cry from the simplicity of the ToGuard H.264 above. At almost five times the price the ToGuard Stealth Recorder is a powerful recording device. With WIFI capability, you can control the camera via your smartphone or tablet or upload and edit video instantaneously to the web. The camera itself is tiny and can be hidden anywhere in the vehicle away from prying eyes. The lens is a super-wide angle lens that can film 170 degrees of the scene in front of you, every lane on the freeway. The LCD screen of the ToGuard Stealth Recorder is 2.45” which is a reasonable size making it easy to change settings and view playback of footage right there on the device. The ToGuard CE906 is larger than the H.264 and looks like a point and click camera that can be suspended from a mount that attaches to the back of your rear view mirror. The camera is cheaper than the Stealth Recorder and more expensive than the H.264 and offers some real functions. The camera starts on and off automatically whenever the car is turned on, and the camera is equipped with lane-departure warning system and forward collision warning system alarms that alert you to danger ahead of time. The ToGuard CE906 Films 170 degrees of the road in front of you giving you a wide spread of what is seen through the windshield. With almost no blind spot, you never have to worry about missing an incident on film. Comes with a 2.7” LCD screen for reviewing footage and changing settings. 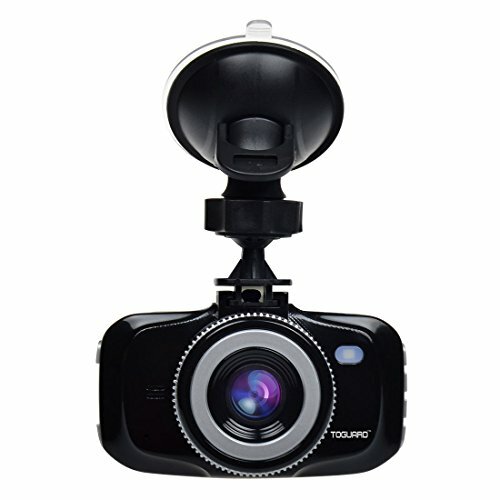 The ToGuard HD 5” dash cam offers yet another alternative to the suction cup or mount design of most dash cameras. The ToGuard HD 5” is LCD shaped your your rearview mirror that attaches directly to your review, covering it and acting as your new mirror. 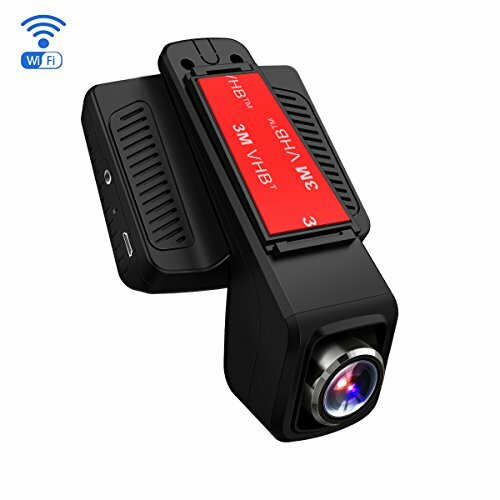 It comes with another smaller boxlike camera can be connected to the back of the car thus giving you footage from the front and behind simultaneously. In this sense, the ToGuard HD 5” is a dual-channel camera. Footage is shown directly on the touch screen LCD cover as a picture within a picture. When reversing, the image from behind will be shown as the larger picture. The screen is a high-definition screen with anti-glare effect, so you see the pictures. The ToGuard HD 5” also comes with WIFI and GPS capability and supports Google maps navigation. The front-facing camera records in 1080P while the rear-facing camera records in 720P. The ToGuard Dual Channel looks a lot like the HD 5” inch listed above. The difference is that the color of the screen on this one looks a lighter color of blue. The Dual Channel attaches over your rearview mirror turning it into an LCD screen that shows footage from in front of you as well as from behind. The front facing camera is a stronger camera recording in 1080P with a viewing angel of 140 degrees while the rear is facing the camera, while only recording at 720P, also boasts night vision capability and is water proof, allowing you to place it outside the vehicle. The ToGuard Dual Channel also comes with G-sensor recording which will automatically lock any file recorded during a moment of unusual vibration, and the loop-recording-feature guarantees you never run out of space on your SD card. The ToGuard H.264 is a small square-shaped dash cam that hanging from your windshield via a suction cup mount. It is small and relatively unnoticeable inside a vehicle. While it only accepts SD cards up to 32GB, it does come with a loop-recording feature that users can turn on in Settings. The ToGuard H.264 films in full HD, 1080P. The ToGuard H.264 is equipped with G-sensor technology, and there is an option for Motion Detection recording if the camera is hardwired to the vehicle. The camera is an excellent product at a meager price, and while it doesn’t come with all the bells and whistles of some more advanced cameras, the ToGuard H.264 is more than capable of giving driver’s clear footage of their travels. A ToGuard dash camera is a good buy for the price. Even the more advanced cameras like the 5” HD dash cameras are cheap when compared to competitors. While the ToGuard cameras do not come with some of the advanced features of other cameras, they serve their purpose for most people. For people looking for basic functionality, a camera that will record endlessly and ensure that important footage is locked, the ToGuard line of dash cameras will do all this and more. Here we’ve provided a list of the best ToGuard dash cams. In offering a range of price and functionality, we hope that you can find something that works for your budget somewhere along the spectrum. In owning a ToGuard dash cam, you will find a new peace of mind that comes with knowing the second pair of eyes is watching over your vehicle each time you take to the road. Dash cam footage could save you an enormous headache in the future, and potentially, lots of money too.